This is not a review - our book is too new for that. Port Veritas is a spoken word organization based in Portland, Maine that was started in 2003 by Peddlar Bridges and then Nate Amadon. Every Tuesday night at the North Star Cafe on Munjoy Hill in Portland, Port Veritas has a poetry event, or a poetry slam, and often, music. Come down and sign up for the open reading. This is the first volume of poetry and prose in an anthology series. Some of the writers are new and young, some are seasoned, some are well known. The writing is fresh, honest and real. 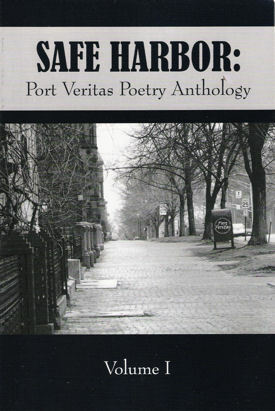 Proceeds from the sale of this book will help to send a Portland poetry slam team to the national competition in Madison, Wisconsin in August 2008. Sales will also help to bring poets and musicians to the North Star Cafe and other venues. This is irony in the 21st century. If I had a gun I would shoot Charlton Heston right between his beady lil eyes. And if I had the balls I'd take a copy of this poem stick it in a dictionary and mail it off to Alanis Morrissette. Irony is the clan I saw on TV the other day. 50 big bad assed rednecks singing Amazing Grace. We sing this at all of our rallies, Big Bubba the grand poobah stutters.I guess the reporter didn't have the gall to tell this big browed throwback that Amazing Grace was written by an ex slave trader who spent the latter half of his life repenting of his sins and speaking out against the atrocity of slavery. Not that it would matter to Bubba, even if I sent him a dictionary he wouldn't know how to spell atrocity. Irony is a certain religious group railing on the gay community for years. Only to find out that getting on your knees at church doesn't necessarily have anything to do with prayer. Irony is the Jaguar I saw on the street the other day. The license plate said DOT COM and in the rear window a white piece of paper with words FOR SALE scribbled with a sharpie. Okay that's not ironic but it is poetic. This is poetry in the 21st century. Ironic, sardonic and completely external. What's wrong with me is what's wrong with the world. Now that's irony, borderline. Paradox.